This is my first time hearing the music of Isang Yun, the South Korean composer who was once kidnapped from Germany and put on trial for his support of Korean reunification. Korean born, Berlin resident Isang Yun, who died last year at the age of 78 in Germany, achieved a certain notoriety by being imprisoned in his native country in 1967 (Stravinsky, Stockhausen, Boulez and Klemperer were among the individuals who petitioned for his release), and his music aimed to create a territory of its own between East and West. 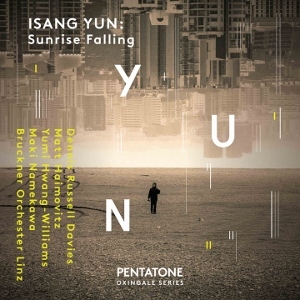 What that means for Sunrise Falling, Pentatone’s two-disc collection of works by Yun, played by the Bruckner Orchestra of Linz conducted by Dennis Russell Davies, is music that veers to extremes, from harmonious beauty to soul-jarring atonalism, dissonance, and pounding. Yet it’s also extraordinarily substantial, which is why it may take quite a few listens to wrap your brain around this vacillating music. Davies offers appreciation, mastery and respect, with some of the richest, crystalline and most extraordinary sound I remember hearing on a live recording (the double album is SACD). Whether or not it’s listenable over and over again is something else entirely. Matt Haimovitz is jawdroppingly good as the soloist in the ferociously provocative, single-movement Cello Concerto from 1976, and Yumi Hwang-Williams is just as superb on the first of Yun’s three concertos for violin, composed five years later — it is here that we get some of the gorgeous lyricism that kept pulling me back in. Both are works of unbelievable power, density, and intricacy, quite unlike anything else I’ve ever heard; the rest of the box set is a fascinating introduction to Yun’s chamber works; solo instrumental pieces for cello and violin; a sonata (pianist Maki Namekawa ferociously attacks the keys in Gasa); and an orchestral showpiece in Fanfare and Memorial. In the beautiful booklet, Yun is quoted from 1983: “A composer cannot view the world in which he lives with indifference. Human suffering, oppression, injustice … all that comes to me in my thoughts. Where there is pain, where there is injustice, I want to have my say through music.” And much of that shows in his intriguing yet dystopian, apocolyptic, confrontational and chaotic music. Recommended for the serious Cal Art-like students and their professors, but others should be prepared that at times it goes beyond frightening and disturbing (which I love here) into beautifully orchestrated but uninspiring, paranoiac noise that may make you a bit jumpy. Sadly, so much of it sounds less like the possible reunification of North and South Korea, and more like a despairing, depressing war. But one which is most well-produced.